WWW.NOBODYWALKSNC.COMNOBODY WALKS 'TIL THE BOSSMAN TALKS! 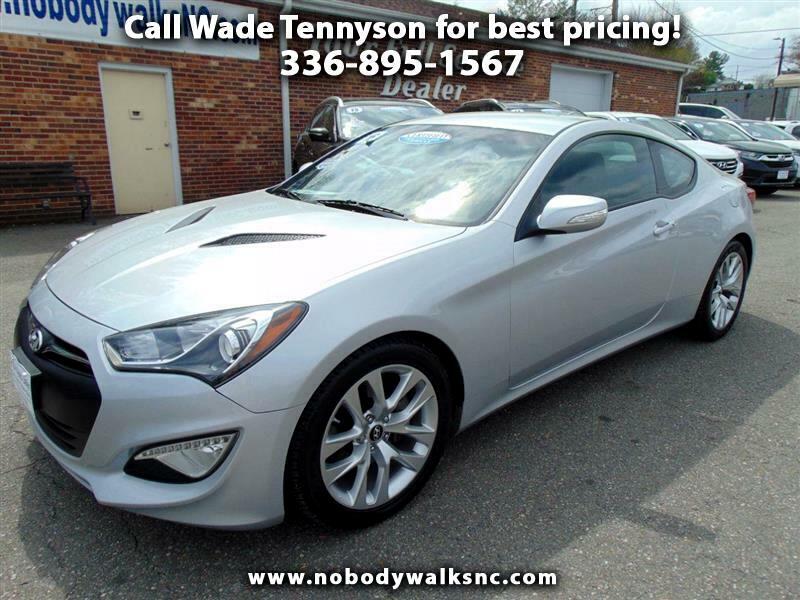 !CALL OR TEXT 336-786-7369 This 2016 Hyundai Genesis Coupe 3.8L Base features Engine: 3.8L GDI DOHC 24-Valve V6 w/Dual CVVT, Transmission: 8-Speed Automatic w/SHIFTRONIC -inc: lockup torque converter and Paddle-shift, 3.909 Axle Ratio, Rear-Wheel Drive, 64-Amp/Hr Maintenance-Free Battery w/Run Down Protection, 130 amp alternator, Gas-Pressurized Shock Absorbers, Hydraulic Power-Assist Speed-Sensing Steering, 17.2 Gal. Fuel Tank, Quasi-Dual Stainless Steel Exhaust w/Polished Tailpipe Finisher, 4-Wheel Disc Brakes w/4-Wheel ABS, Front Vented Discs and Brake Assist, Wheels: 18" x 7.5J Fr. & 18" x 8.0J Rr. Alloy -inc: Silver painted, Euro flange wheel lip, Steel Spare Wheel, Compact Spare Tire Mounted Inside Under Cargo, Clearcoat Paint, Body-Colored Rear Bumper, Black Side Windows Trim, Black Front Windshield Trim and Black Rear Window Trim, Body-Colored Power Heated Side Mirrors w/Manual Folding, Variable Intermittent Wipers, Front Windshield -inc: Sun Visor Strip, Grille w/Chrome Bar, Trunk Rear Cargo Access, Fully Automatic Projector Beam Halogen Daytime Running Headlamps w/Delay-Off, Front Fog Lamps, Radio: AM/FM/SiriusXM/CD/MP3 Audio w/6 Speakers -inc: 6" Color Display, iPod/USB, MP3 auxiliary input jacks, Bluetooth hands-free phone system and shark-fin antenna, Radio w/Seek-Scan, Clock and Steering Wheel Controls, Streaming Audio, Window Grid Antenna, Front Bucket Seats -inc: up/down/tilt headrests and front seatback pockets, Front Seats w/Manual Driver Lumbar, 4-Way Passenger Seat -inc: Manual Recline, Fore/Aft Movement and Manual Rear Seat Easy Entry, Full Folding Bench Front Facing Fold Forward Seatback Rear Seat, Manual Tilt/Telescoping Steering Column, Gauges -inc: Speedometer, Odometer, Engine Coolant Temp, Tachometer, Oil Temperature, Trip Odometer and Trip Computer, Fixed Rear Windows, Leather/Metal-Look Steering Wheel, Compass, Proximity Key For Doors And Push Button Start, Remote Keyless Entry w/Integrated Key Transmitter, Illuminated Entry, Illuminated Ignition Switch and Panic Button, Remote Releases -Inc: Power Cargo Access and Power Fuel, HomeLink Garage Door Transmitter, Cruise Control w/Steering Wheel Controls, Automatic Air Conditioning, HVAC -inc: Underseat Ducts, Illuminated glove box, Interior Trim -inc: Metal-Look Instrument Panel Insert, Metal-Look Door Panel Insert, Metal-Look Console Insert and Chrome/Metal-Look Interior Accents, Full Cloth Headliner, Cloth Door Trim Insert, Leather/Chrome Gear Shift Knob, Cloth seat trim, Day-Night Auto-Dimming Rearview Mirror, Driver And Passenger Visor Vanity Mirrors w/Driver And Passenger Illumination, Driver And Passenger Auxiliary Mirror, Full Floor Console w/Covered Storage, Mini Overhead Console w/Storage and 2 12V DC Power Outlets, Front Map Lights, Fade-To-Off Interior Lighting, FOB Controls -inc: Trunk/Hatch/Tailgate, Instrument Panel Covered Bin, Driver And Passenger Door Bins, Power 1st Row Windows w/Driver And Passenger 1-Touch Up/Down, Delayed Accessory Power, Power Door Locks w/Autolock Feature, Trip Computer, Outside Temp Gauge, Digital/Analog Display, 2 12V DC Power Outlets, Electronic stability control (ESC), ABS And Driveline Traction Control, Side Impact Beams, Dual Stage Driver And Passenger Seat-Mounted Side Airbags, Low Tire Pressure Warning, Dual Stage Driver And Passenger Front Airbags, Curtain 1st Row Airbags, Airbag Occupancy Sensor, Driver And Passenger Side Airbag Head Extension SANTIAGO SILVER METALLIC, BLACK, CLOTH SEAT TRIM H and H Auto Sales has brought quality Certified pre-owned cars,trucks,vans and SUVs to the people of Surry County,Mount Airy, Elkin, Winston Salem, Hillsville ,and Galax. Customers are our #1 priority from the sales staff,finance department,service and clean-up department,when it comes to selling a vehicle.The majority of our vehicles are off lease,program cars or local trade-ins! !Hand picked from our owner of 40 year experience!! Call or Text 336-786-7369 H & H AUTO SALES .. www.nobodywalksnc.com This is a Gold checked CERTIFIED vehicle, and could be eligible for up to a 5 year /100k mile factory extended warranty !! We also give a FREE 30 day or 2000 mile POWERTRAIN WARRANTY on most of our vehicles !! **Your FULL SERVICE DEALER**FREE COMPLETE CARFAX !! We are Proud Member's of the Better Business Bureau (BBB) & National Independent Automotive Dealer Association (NIADA) !! Please contact us at : sales@handhauto.com or call /text 336-786-7369 for more details and photos!!! We are more than willing to meet our customers off-site within reason for a test drive. Thanks for looking!! A **Disclaimer: All vehicles are listed with equipment and pricing to the best of our knowledge, Some information could be unintentionally missing or inaccurate. We (H & H Auto Sales) will not be responsible for any discrepancies.WHERE NOBODY WALKS 'TIL THE BOSSMAN TALKS!! Message: Thought you might be interested in this 2016 Hyundai Genesis Coupe.